The renovated bathroom. 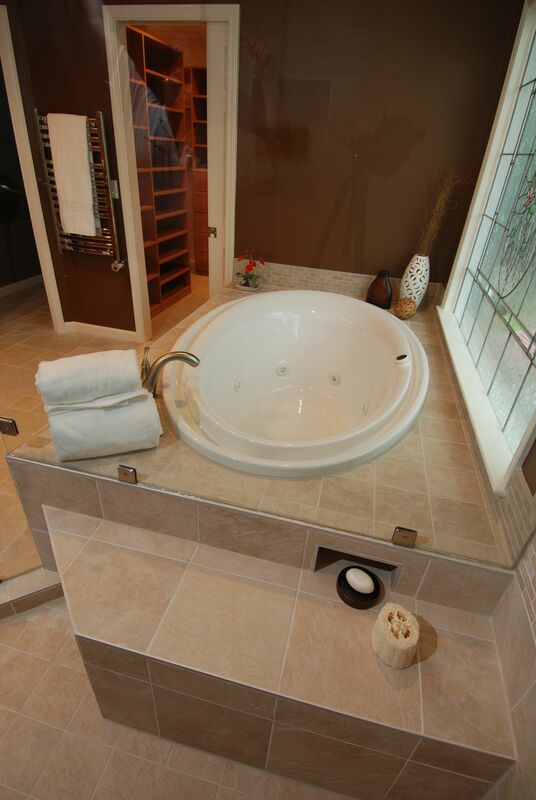 The large Kohler Purist whirlpool is a main feature – it’s deep allowing the homeowner to soak comfortably. Another luxury feature of the bathroom is the towel warmer seen on the left side of the photo. In the new bathroom, the tub deck carries into the shower instead of a short wall to separate the spaces. 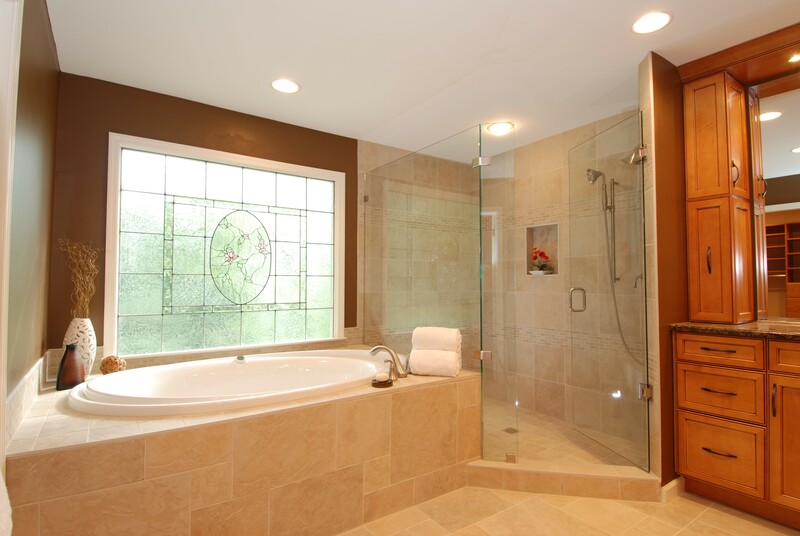 The shower glass sits on the tub deck and maximizes the space in the shower. The new tub, shower, and vanity. 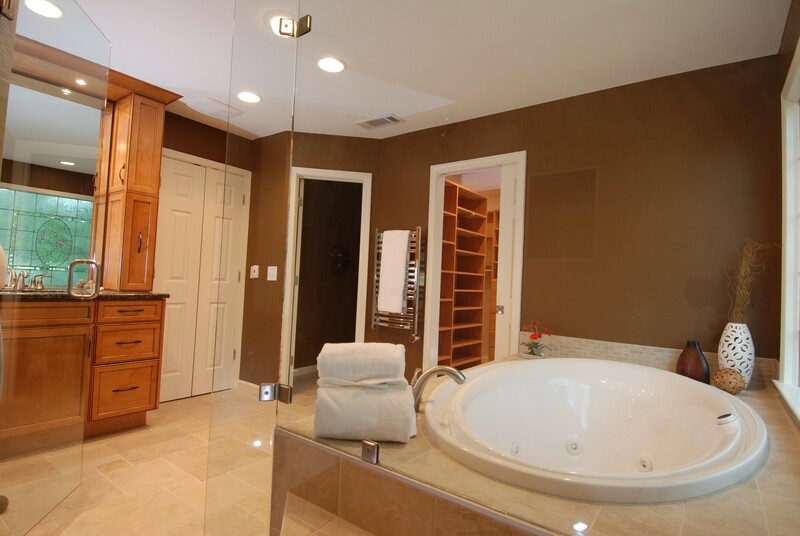 The tile and cabinets are warm toned and the new vanity maximizes storage space. 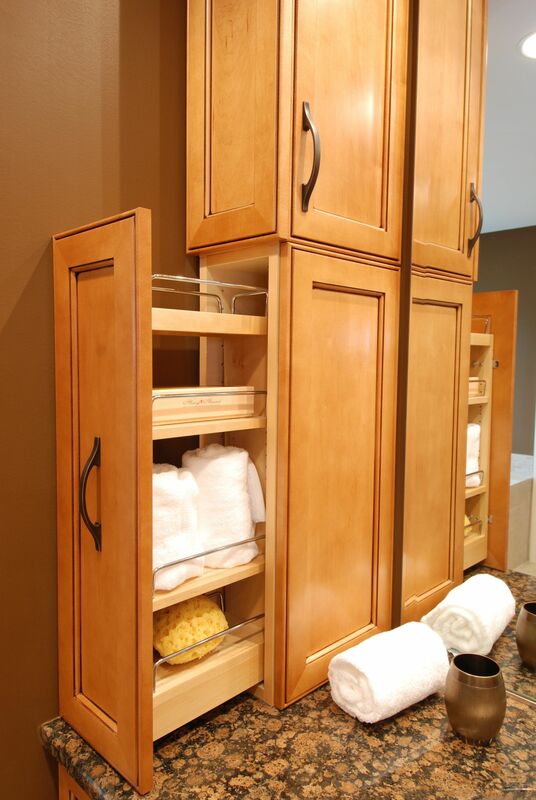 the cabinetry was custom built to match the available space. 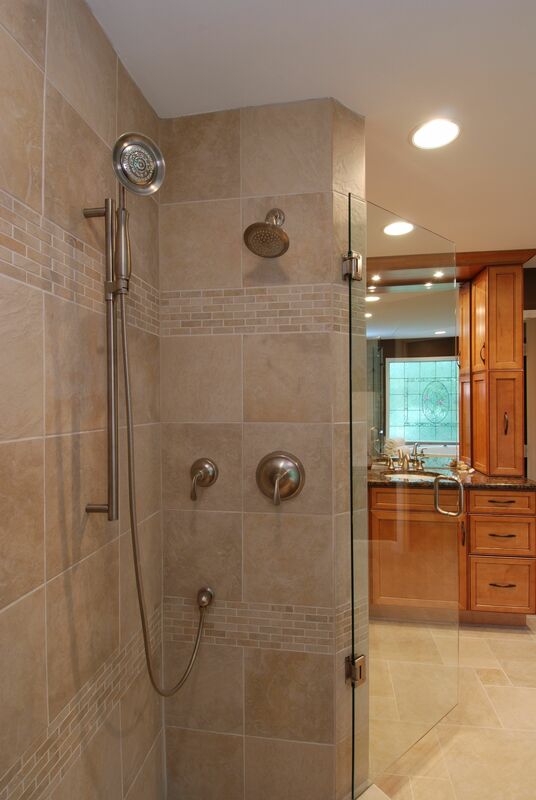 The shower has a standard fixed shower head and a hand held shower head on a slide bar so the height can be adjusted. Another view of the renovated space showing the large tub and closet entrance. From the inside of the shower. There is a small niche under the tub deck to hide a razor and a bar of soap. Because the tub was so deep the bench in the shower had to be lowered so it was at the proper height to sit on. A closer look at the finished vanity. 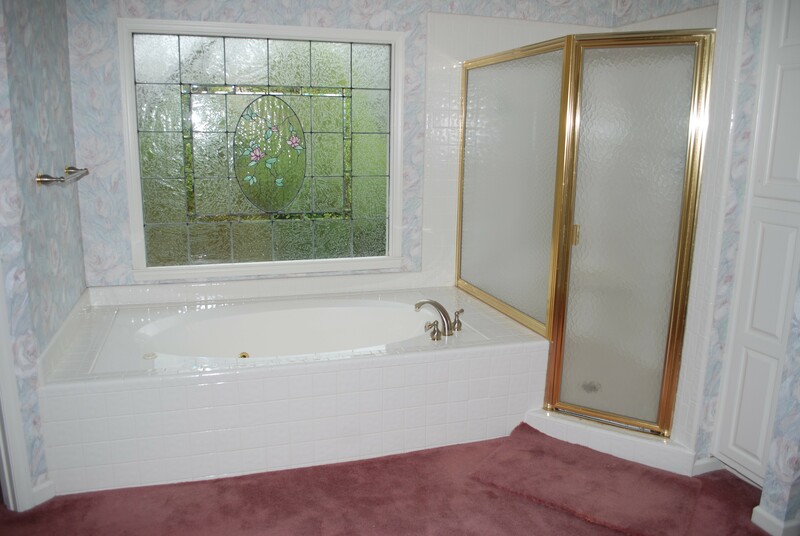 Satin nickle faucets and shower fixtures complete the look. To maximize storage space we designed the columns to have pull out storage in the bottom and a door in the upper part to replace a traditional medicine cabinet. 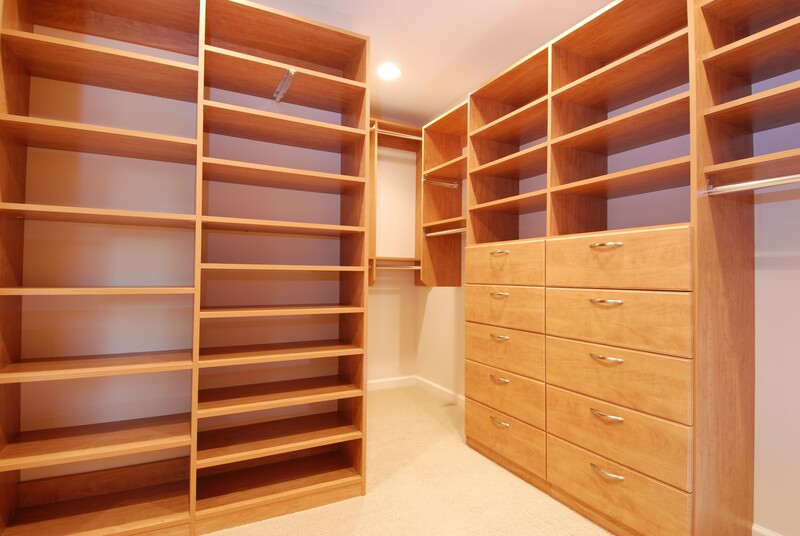 Part of the renovation was to upgrade the closet storage. There’s plenty of room for shoes and storage for clothing. The ceilings in the closet were high enough to hang clothes on an upper closet rod. But part of the problem is being able to reach the upper items. 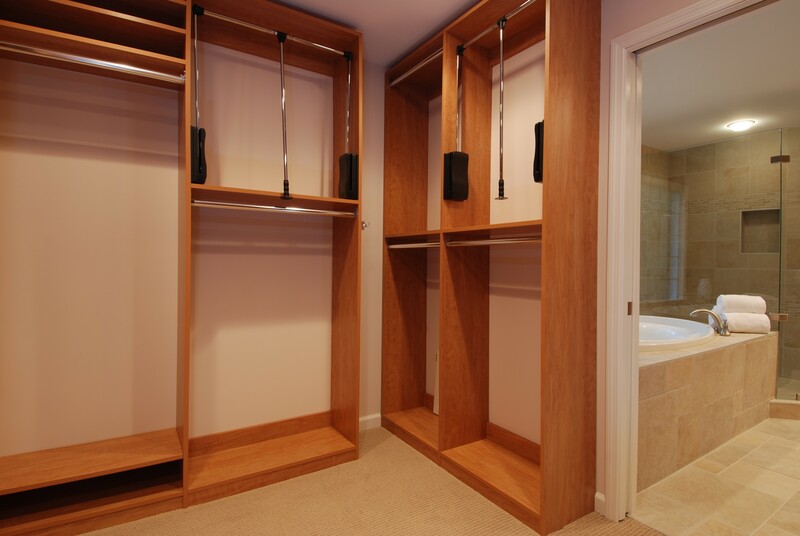 With these pull down closet rods, the space can be utilized and there is no need for a step stool. 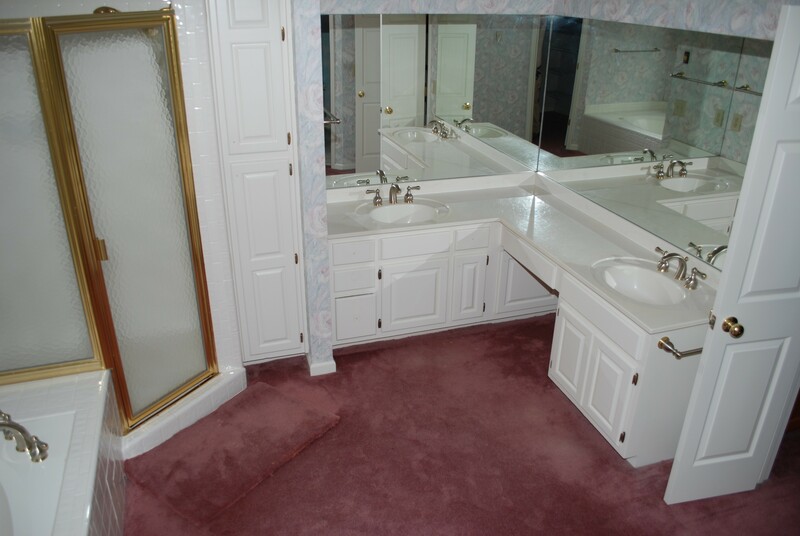 The original bathroom – the carpet and color was a clear indication that it was time to update this bathroom. The two vanities before the remodel. The make up area in a smaller bathroom takes up quite a bit of space and many owners choose to eliminate it. 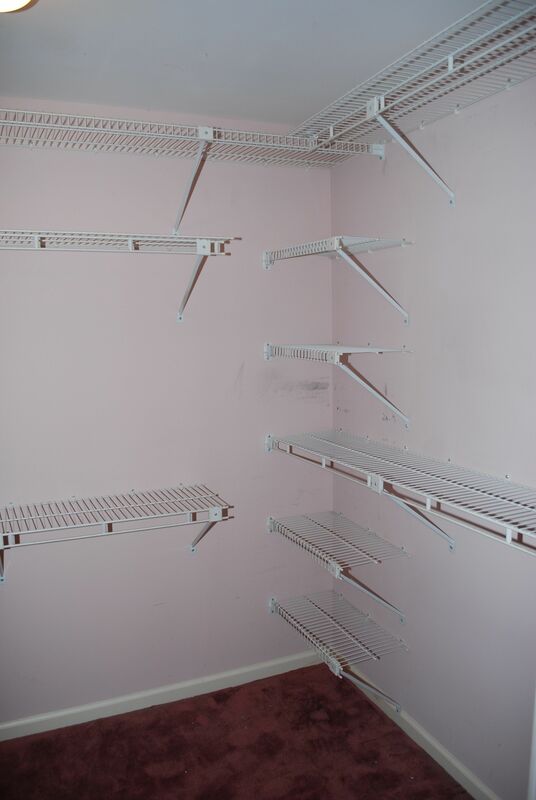 In the original closet, the shelving and storage was inefficient. The space didn’t meet the homeowners needs.